It's easy to turn your PC into a music studio. Start by connecting an electronic musical instrument to your computer with the supplied USB MIDI cable. Within minutes you'll be able to play songs while they are being recorded on your PC. Complete with attached USB cable and MIDI in and MIDI Out cables Powered via the USB cable.A so no power supply or batteries required. USB Sound Adapters are used for converting analog sound to digital signals or visa-versa. You can get these sound adapters at SF Cable and get them ordered at your door steps. 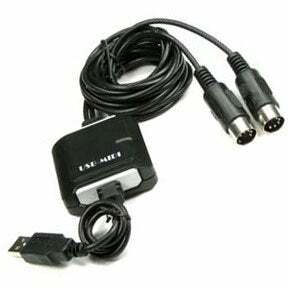 We have a wide range of sound adapters which include USB to MIDI adapter cable, USB A to 2 x DIN-5 and other products. You can trust the quality of the products as all products are sourced from ISO 9001-2000 registered manufacturers and are RoHS compliant. Products offered at SF Cable are environment friendly and offered at very competitive prices by eliminating the middlemen. You also get good after sales service and lifetime technical support on all our products.